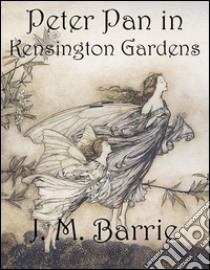 Peter Pan in Kensington Gardens, J. M. Barrie; Illustrated Arthur Rackham, 1910. This is one of four major literary works by Barrie featuring the widely known literary character he originated, Peter Pan. James Matthew Barrie (1860–1937) was a Scottish author and dramatist, best remembered today as the creator of Peter Pan. Peter is a seven-day-old infant who, "like all infants", used to be part bird. Peter has complete faith in his flying abilities, so, upon hearing a discussion of his adult life, he is able to escape out of the window of his London home and return to Kensington Gardens. Upon returning to the Gardens, Peter is shocked to learn from the crow Solomon Caw that he is not still a bird, but more like a human – Solomon says he is crossed between them as a "Betwixt-and-Between". Unfortunately, Peter now knows he cannot fly, so he is stranded in Kensington Gardens. At first, Peter can only get around on foot, but he commissions the building of a child-sized thrush's nest that he can use as a boat to navigate the Gardens by way of the Serpentine, the large lake that divides Kensington Gardens from Hyde Park.